My recent article explored the variety of predictions for the growth of the augmented reality and virtual reality industry. While these predictions varied wildly, all of them showed it to be a sector of huge growth in the next 10 years, with all research showing compound annual growth rates of between 40–80%. Some studies predicted the industry to grow bigger than the mobile phone industry is now. So, no matter who you ask, AR and VR is going to be a big thing, and companies need to align their service offerings with what their clients are going to come to expect. This means there will need to be some level of adoption of AR and VR in addition to existing service offerings. At the simplest level, current service offerings from an architect would be a set of 2D drawings that cover plans, elevations, sections, details, kitchen layout, lighting layout etc. With this huge expected growth in the AR and VR industry, clients are going to be exposed to AR/VR in some way through another project or another architect. And in my personal experience it tends to blow people away. So, it naturally follows that clients are going to start expecting some form of immersive experience as part of the design process. One of the problems is that many architects don’t have experience working with AR or VR and don’t know where to start. A good place to start is using IrisVR (this isn’t an advertisement, it’s just a good product). IrisVR is a program that lets you show your 3D models in VR with one click. It takes less than a minute and you’re in VR. There are other options out there, but in my opinion, this is the best one to start with. There is an add-in for Revit and Navisworks, and it accepts any FBX and OBJ file, so its pretty damn flexible. Typically, engineering or architectural models have lots of detail and data that causes framerate drops in VR, which pretty much destroys the experience. But IrisVR have got some type of magic going on in the backend that makes these experiences run pretty smoothly. You’ll still need a decent graphics card (think along the lines of a GTX 1060) on a decent specced computer though. Being able to understand 2D drawings is like understanding another language. It’s not something that the general person truly knows how to do. And its even hard for an experienced person to visualise how big a 3m x 3m bedroom really is, how their furniture will fit within it, and how much room they have to walk around it. This is where VR has its major benefit. By putting someone inside the 3D model at full scale, they can understand how big a room is, in a way that simply isn’t possible with 2D plans or even a 3D model on a computer screen. This completely breaks down that technical barrier between the architect and the client. The big benefit of this is that the client can now provide useful feedback based on an actual understanding the design. Whether this is a good thing or not is questionable when you’re trying to hit deadlines; but it’s a heck of a lot better than getting ridiculous feedback or requests from a client that doesn’t even understand the design. So, if you’ve ever felt frustrated trying to explain a design to a client, please just use VR. 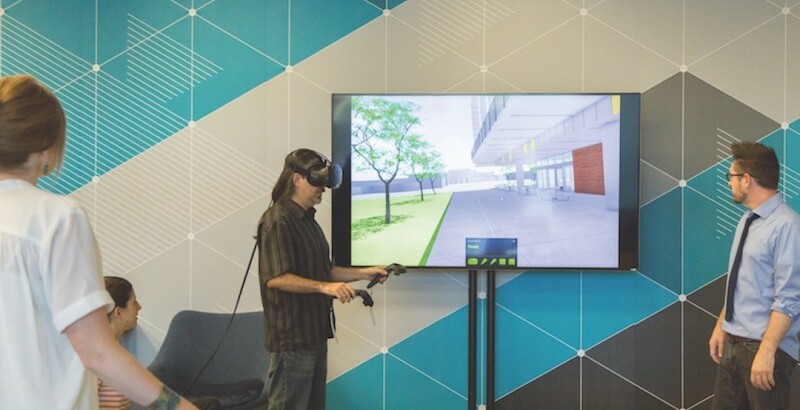 An architect using VR for client walkthroughs is probably the simplest use of immersive technologies, but it’s a stepping stone for some more advanced experiences. These walkthroughs can also be used in engineering firms to assist in winning projects. By using VR at a proposal meeting, the design engineer can put the client into VR and walk them through the critical aspects of the design. Perhaps there’s a difficult part to design, due to site constraints. By putting the client into VR, they can see for themselves what the issue is, and are likely to be less combative if this results in increased costs. It’s also a show of good faith to the client. It shows them that you have nothing to hide and are trying to be as transparent as possible. One of the largest current uses for VR is in training new staff. Walmart recently purchased 17,000 VR headsets to train all its new staff. The medical field has also seen VR as a highly valuable component to introduce students to surgery without the need for cadavers or mannequins. This same thinking can be easily applied to construction training or pre-construction planning. 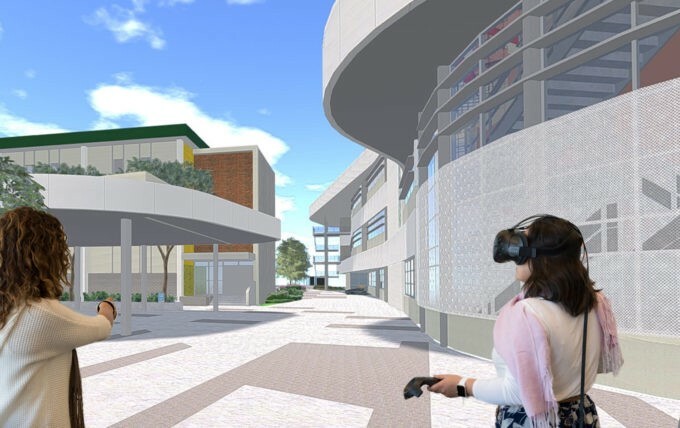 For example, an engineering firm could produce a staged construction model of a new building and show it in VR. The engineering design team can then meet with the construction team in order to plan the construction process. One major benefit of this is spotting safety issues before we reach the physical site. Safety issues can cause huge delays worth hundreds of thousands of dollars on site. However, if we can pick up these issues before construction starts, they can actually be solved as a “safety in design” issue, as opposed to an issue for the construction team to figure out. Yes, this does place more onus and risk on the design team to think of the construction process as part of the design process. But if we want the AEC industry to thrive, we must continue to search for efficiency gains like this. 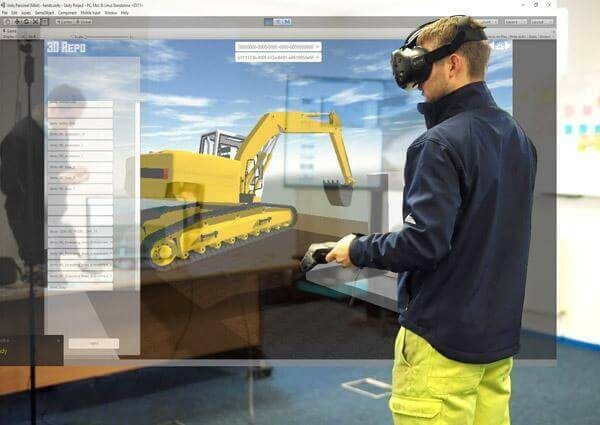 Again, in this example, VR is being used to break down the barrier of understanding between the design engineer and the construction team. When everyone’s on the same page, we can develop more effective solutions. AECOM was tasked with a community consultation project for a large replacement bridge in a sensitive area of Florida. The bridge would impact everyone in the local area, and as such, it was everybody’s concern. VR was used to help people understand the design. This is the perfect example of people being resistant to change when they don’t understand it. I know locally here in Newcastle, there was recently a lot of opposition to the new light rail project running down the main street of Newcastle. Perhaps if a VR experience was used as part of the community consultation process, a lot of community disgruntlement could’ve been avoided. Now that its finished, I think people can finally understand the huge benefit of having unimpeded access to the foreshore. It’s just a shame this realisation couldn’t have been achieved earlier in the project. Got a design that difficult to explain? Use VR. Get everyone on the same page. If you feel like this story was useful or informative and think others should see it too, make sure you hit the ‘clap’ button. I'm a structural engineer based in Sydney, Australia with a passion for immersive technologies such as VR and AR.